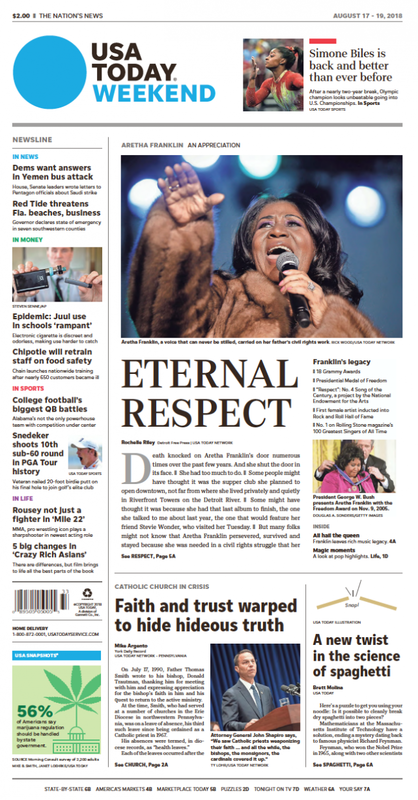 Aretha Franklin, the world’s Queen of Soul, died on Thursday. She was 76. 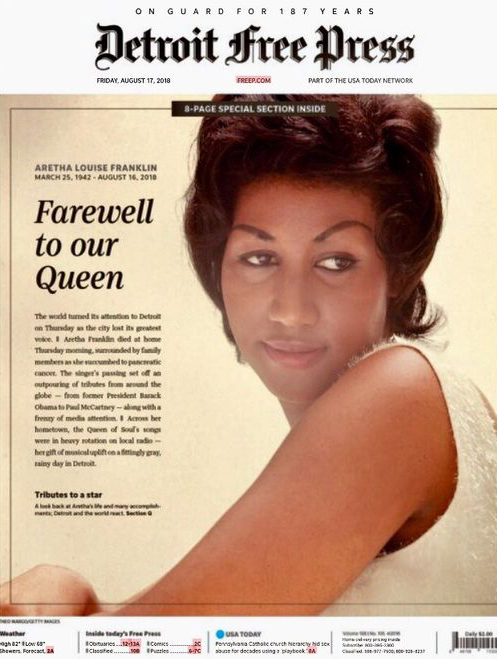 She has left behind an extraordinary legacy of music that moves, in oh so many ways, and songs that instill confidence and unleash untapped power…but more than that, she left us with anthems of great import, her most widely recognized being RESPECT. Originally a song by Otis Redding, “Respect” was written and recorded by him in 1965, which interestingly ended up being a significant one for him as well. (It was his second Top 40 hit, following “I’ve Been Loving You Too Long (To Stop Now),” and it helped establish Redding on mainstream radio. Otis performed the song at the Monterey Pop Festival in 1967 and this was a defining performance for the singer, who died in a plane crash six months later). 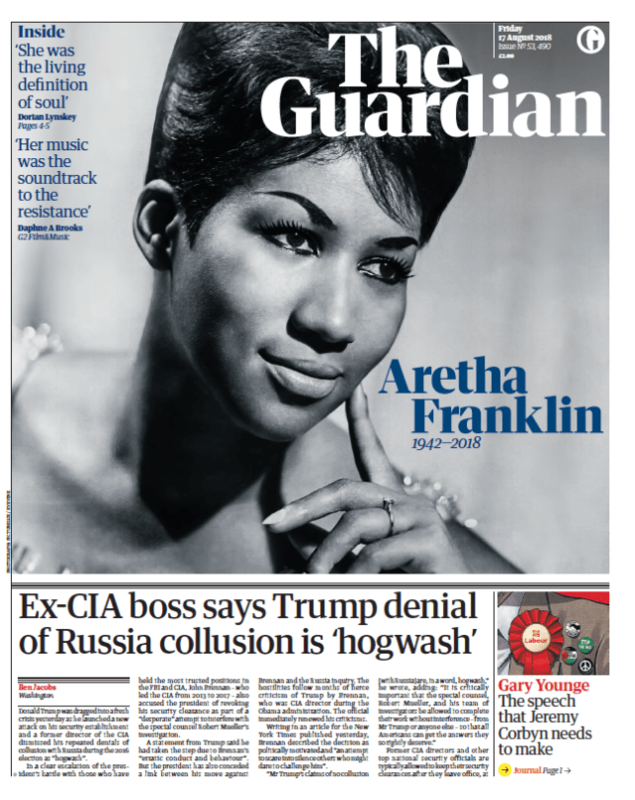 The song also became a hit internationally, reaching #10 in the UK and helping to transform Aretha Franklin from a domestic star into an international one. FUN FACT: Otis Redding himself was impressed with the performance of the song. At the Monterey Pop Festival in the summer of the cover’s release, he was quoted playfully describing “Respect” as the song “that a girl took away from me, a friend of mine, this girl she just took this song”. 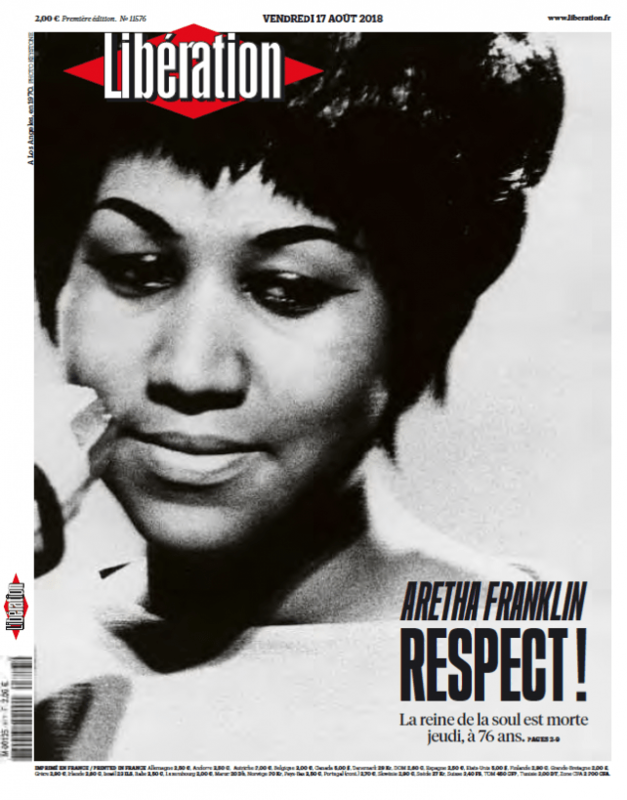 “When her hit single ‘Respect’ climbed the charts in July 1967, some fans declared that the summer of 1967 was ‘the summer of ‘Retha, Rap, and Revolt. '” Adorable! 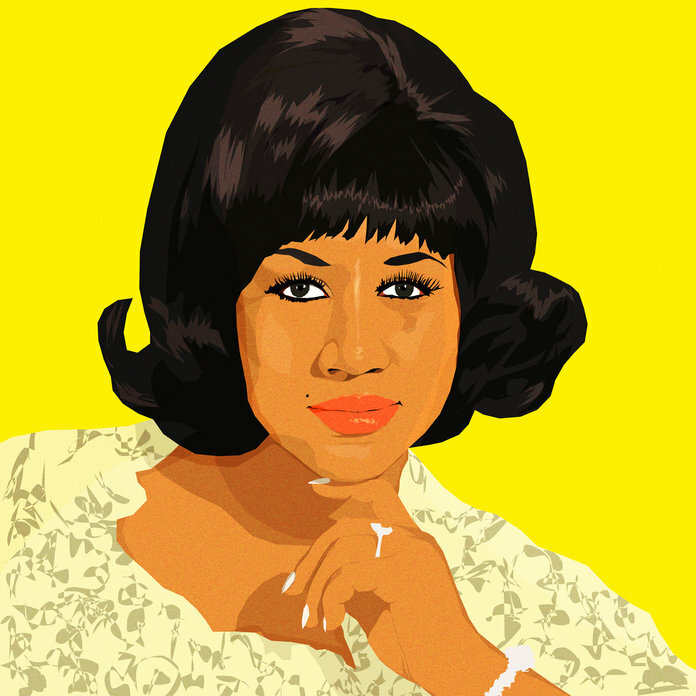 I am partial to many of Aretha’s songs but “Respect” hits some real nostalgia notes in me. Not only is this amazing song a landmark anthem, it’s a ton of fun! 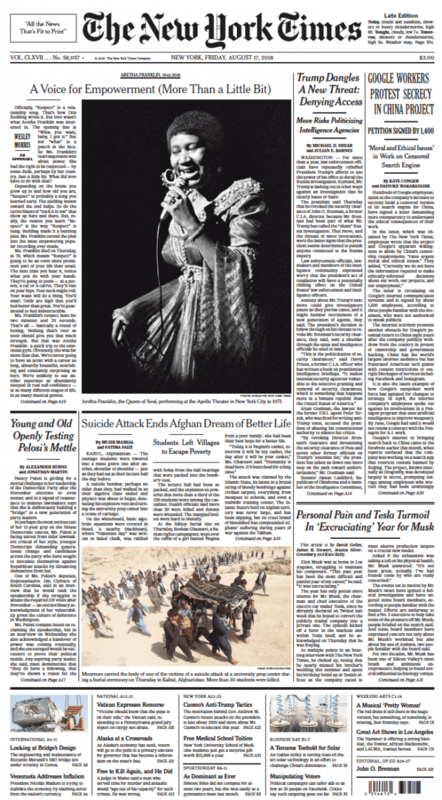 The song came out at the apex of a social and political climate on the verge of a major shift. “Respect” hit at a time when millions of people were feeling marginalized in an era where inequality and social injustice was the norm. This song became a theme song in the civil rights movement and a feminist anthem that encouraged women to not only recognize their worth but to insist that others acknowledge and respect it. It was then, and is now still, a song of empowerment. In addition to all that (and so much more), it’s just a damn good song! It was an anthem of sorts for me too, and it was featured prominently on the jukebox of my bar. When I opened my bar, music was a priority in the planning. When I ordered the jukebox, I asked the company rep about the music. I was told that the company uses demographics and research on what songs perform best in terms of frequency of play and that they load the music based on those metrics. And I said, “Ah, nah, I don’t like that. That’s not going to work. I want to pick and choose the music that’s going to be on my bar’s jukebox.” And so I did. As you can imagine, that jukebox had some incredibly kickass music on it. And my bar developed a reputation for it even. I always got a charge when new folks would walk in and say “We heard this place has the best jukebox in town!” Oh yeah, proud mama. Aretha Franklin’s “Respect” was one of the first songs I chose to be on the jukebox. It often was the ‘Last Call’ anthem. At the end of the night, I’d cue up the song and call “Last Call for alcohol!” and, with the speaker control behind the bar, I’d crank that baby up and “Respect” would vibrate and dominate. It would be so loud that it was virtually impossible to hold a conversation for those few minutes; the customers just had to get up and dance. It was a highlight on so many nights and it always amazed me how that song could completely change the mood and the dynamic of the place. Everybody would be singing and dancing and laughing because that song just moves people. It evokes an ultimate feel-good and you just can’t help but smile when it plays. Every time I hear it now, my mind wanders to my old “bar days”. Some great and interesting memories for sure. 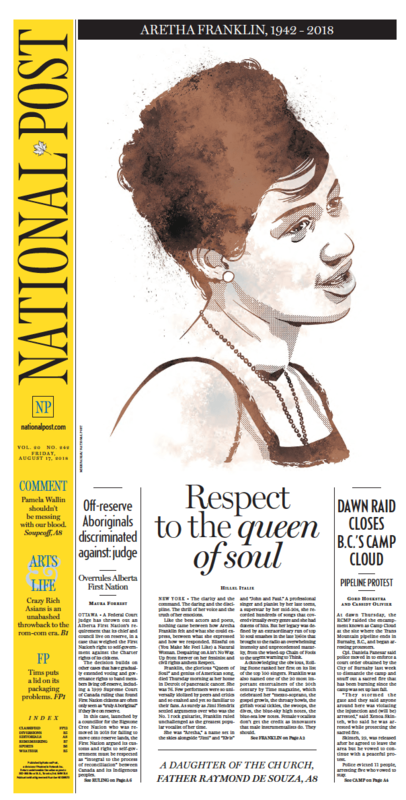 I’m not going to do a big write-up on Aretha because the world is inundated with articles and stories and tributes to our Queen of Soul. There are several wonderful pieces online and I’ll share links of some that I particularly enjoyed. I will leave you with some music though. The following is my Plug and Play Aretha Playlist for your listening pleasure. It kicks off with my top 5 favorite Aretha songs. Enjoy! (You Make Me Feel Like) A Natural Woman – 1967 (co-written by Carole King, Gerry Goffin and Atlantic Records’ Jerry Wexler); the video in the playlist is Aretha’s 2015 performance at the Kennedy Center Honors in tribute to the song’s co-writer Carole King who was receiving a Lifetime Achievement Award. REST IN ETERNAL PEACE ARETHA! 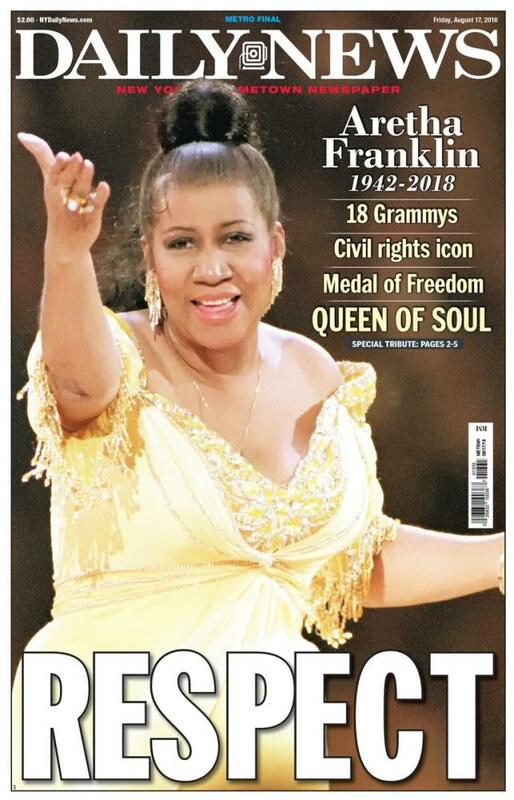 “Rest in eternal peace” was the sentiment expressed by Barack Obama in his social media tribute to Aretha. He had a close affinity with her and her music moved him to tears (as evidenced in the video of Aretha’s performance for Carole King in December 2015 when she was receiving the Lifetime Achievement Award at the Kennedy Center Honors). Aretha also performed at President Obama’s 2009 Inauguration. By Simon Dumenco. 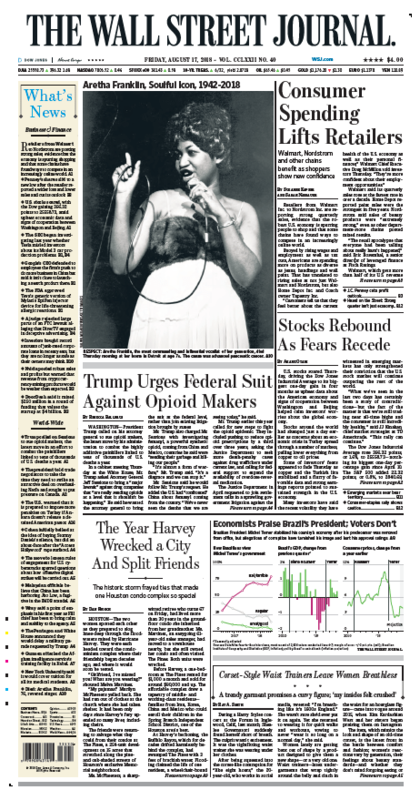 Published on August 17, 2018 . This entry was posted in Stories and tagged #4M, #MondaysMusicMovesMe, Aretha Franklin, Monday's Music Moves Me, music, Queen of Soul dead at 76 by greyzoned/angelsbark. Bookmark the permalink. You did a great job with this tribute to the Queen of gospel-tinged Soul & R&B, Aretha Franklin! Seems to me you had your own version of the Shady Dell going with that bar of yours. Good for you for programming the jukebox yourself instead of allowing some guy in a suit with a clipboard to do it for you based on research data. If the Dell had been set up that way we’d have been waltzing around to “How Much Is That Doggie In The Window” (sorry Luca & Picasso) instead of the cool obscure tunes we helped popularize. I can just hear Aretha shouting “Respect” every night when it was “last call for alcohol” at your bar. I noticed that you included some of my own Aretha favorites on your play list. I recently discovered and was bowled over by her early career 1960 Columbia single “Today I Sing The Blues.” Other favorites by the great lady include “I Never Loved A Man,” “Do Right Woman, Do Right Man,” “Chain of Fools,” “Prove It,” “(Sweet Sweet Baby) Since You’ve Been Gone,” “Ain’t No Way,” “Think,” “The House That Jack Built,” “I Say A Little Prayer” and “See Saw.” With the exception of “I Say A Little Prayer,” all of the singles named above from “Chain Of Fools” to “See Saw” including those ballad flip sides, were bit hits at the Shady Dell. I like Aretha’s version of “I Say A Little Prayer” more than the Dionne Warwick original. “Until You Come Back To Me” is another great one. Thank you for posting all those newspaper articles, too. 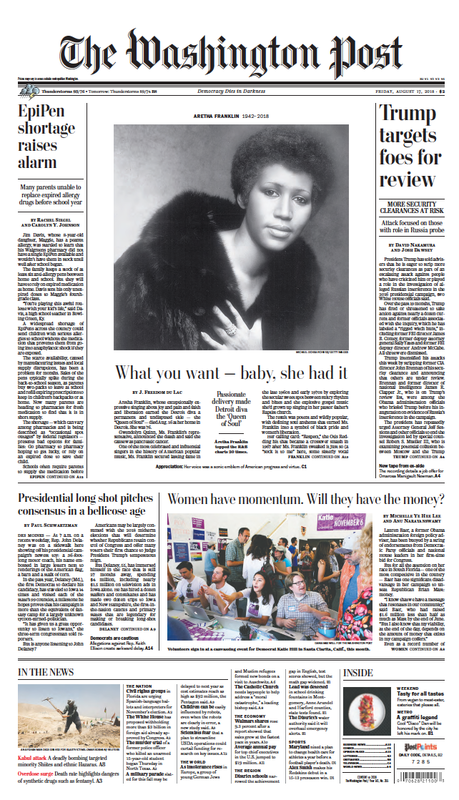 Aretha Franklin earned and richly deserves the world’s respect for her great body of work in the recording studio and for being an ambassador of goodwill, an inspiration and source of empowerment for women and minorities. Thank you again for this touching tribute. 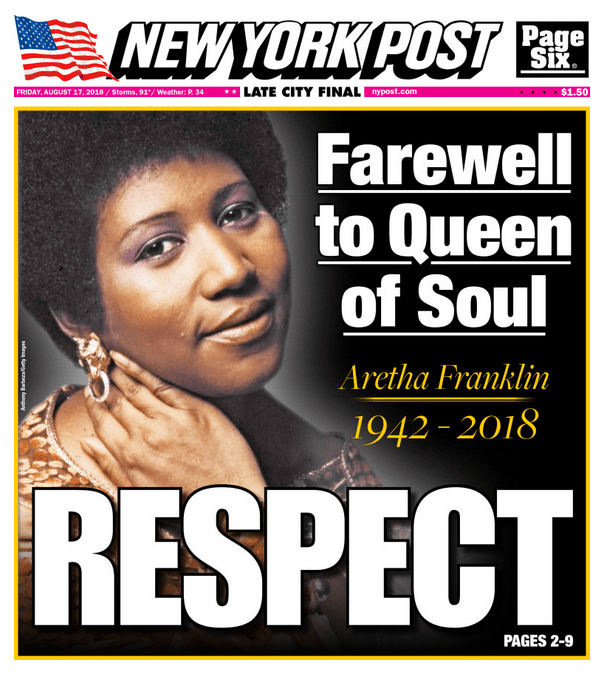 You gave Aretha her “propers,” an oft misunderstood word from her “Respect” hit. Enjoy the rest of your week, dear friend Michele! Hey Tom. I have to run out for PT now and will read your “Meaty” (YAY!!! and THANK YOU!!) comment when I get back but while you were composing your comment I was adding a funny video of Obama singing Respect. Please, if you have 2-3 minutes, go back in and check it out. It’s just below the song list. Will be back soon… will be after 4 my time. I watched it, Michele. Whoever did the editing did a great job. Obama’s “cover” of “Respect” is #1 with a bullet on my hit parade! Thanks for calling my attention to it. Now I am inviting you to come rock with me at my place. Wow! What a wonderful tribute. I loved her. And one of my favorites of course was Respect!! She truly was one of the greats. As usual, you really did your due diligence and gave this post your all. Thank you for that! I’m sorry for the late visit and I’m not going to fool you girl but I haven’t had a chance to read your tribute post. However, I did listen to your playlist in the background while I tackled some chores around the house, replied to comments, and do return visits. I will come back tomorrow to read it. It’s just been a crazy week for me. I hope you understand. That being said at a glance you really did a great job showing your respect for the late legend. I did notice the slide gallery. I hadn’t seen any pictures of Aretha in recent years and was a bit stunned to see her not look so well. Your playlist is A-One! Thanks for sharing and I will be back in the morning! Have a boogietastic day, my friend! Oh, yes thanks for the prayers! There is a reason that Aretha was crowned the Queen of Soul. Nobody did it better, not Diana Ross, not Tina Turner, Dionne Warwick, nobody!!! Thanks for stopping by Driller’s Place this week. Glad you enjoyed the tunes. I have a few ideas for up coming “Your Choice” weeks that you might like. I’m thinking that and Eric Clapton, Santana, Joe Bonamassa blues/guitar post might work. Also country artists covering “The Stones” better than the Sones. Have a blessed week-end and see you Monday when I feature country “drinkin’ songs”. I listened to several of your playlist songs, part of the Obama “Respect” and marveled at all the headlines. Whoever says that one person can not change the world is wrong. Respect for a creative who did just that.